Japan's greatest export returns with another amazing aural journey. 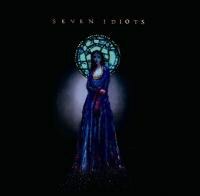 Japanese genius World’s End Girlfriend returns with a seriously strange and beautiful range of songs, sounds, and styles on its latest release, Seven Idiots. With influences that run the gamut from contemporary classical to 8-bit music and pretty much everything in between -- often in the space of a few measures -- World's End Girlfriend creates a universe that is uniquely his own. Few artists can traverse those distances with the ease and grace that World's End Girlfriend does and it's evident via tracks such as “Ulysses Gazer”, a song that single-handedly redefines epic, the sublime “Bohemian Purgatory” trilogy at the album’s center, and the aptly-titled closer “Unfinished Finale Shed”. This is not eclecticism for eclecticism’s sake, not music created for the sole purpose of impressing you with a range of sounds but ultimately absent of any real sense of compositional authority or musical sensitivity. This is instead a near-perfect capture of the sounds of our times. “Les Enfants du Paradis” is alternately aware of those who simply want to clap their hands and say yeah but it also contains swooping, soaring melodies that make the listener gaze dreamily into the future and think about a full-on orchestral composition from World's End Girlfriend. There, as on tracks such as “Teen Age Ziggy”, where the composer gets his metal on, we’re reminded of the enigmatic genius of Steve Vai, how his compositions rely on lush, alien melodies that often go by at frightening, frantic speed but are nevertheless informed by an ethereal and eternal beauty that is there for anyone to capture if only they know what to listen for. Moreover, World's End Girlfriend’s compositions are carried through with a gentle playfulness, a warm sense of humor that is too often absent in contemporary music but serves to buoy this -- and other releases from the composer -- along. That humor makes appearances in compositions such as the aforementioned “Ulysses Gazer”, the opening “The Divine Comedy Reverse” and “Galaxy Kid 666”. Of course those are just a few examples, as with anything the artist does isolating one moment or one element of his genius is nigh on impossible, for this is music that has to be taken as a whole. The album has already been available in World's End Girlfriend’s homeland for some time and no doubt its official arrival on these shores this summer will turn some ears and set some listeners on their heads. But whatever praise he earns, it is richly deserved -- this is, after all, a man who’s been releasing terrifyingly good albums for over a decade and whose collaboration with Mono (2006’s Palmless Prayer/Mass Murder Refrain) is an effortless effort, unique among its kind. Perhaps it is best not to heap any more superlatives upon this already impressive composer and instead allow the listener to find his or her own rewards among the richly rewarding compositions and musical moments here. Once you’ve absorbed Seven Idiots, into your psyche there will be no going back. And as for World’s End Girlfriend himself? He is a rare and formidable treasure and any nation that calls him its own is lucky to have him but, alas, he remains such a giant talent that no one nation can contain him. He belongs, quite simply, to the universe.